The interference of the Indian Government through its various intelligence agencies in Sikh affairs, both within Indian occupied Punjab and our diaspora communities, has been an ongoing process since 1984. A recent article in the Washington Post (see Picture 1 below) is further proof of the depths India will go to in order to quash and criminalize any form of dissent from the Sikh community. In recent years, we have seen an escalation of this sort of interference as this is the 3rd case of interference being uncovered by Germany alone where India has been trying to infiltrate the Sikh community [(2014 “Ranjit Singh” was arrested as an Indian spy gathering information on the Sikh community (Aljazeera); 2016 a German Immigration worker was arrested in connection with working for Indian agencies and passing on information on the Sikh community (Globe & Mail)]. The worrying aspect of this recent uncovering of Indian spies is that we can’t be sure how many of these types of individuals exist within the United Kingdom, United States, Australia and even Canada. 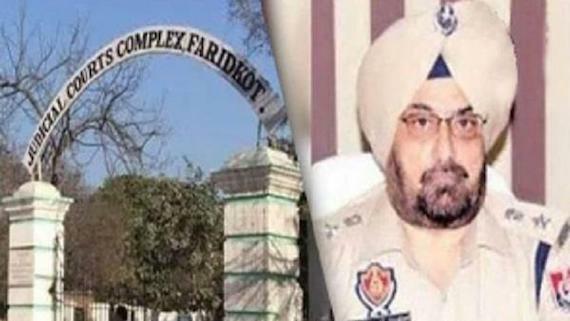 Often it is Indian Consulate officials in cities across the world that will target members of the existing Sikh community and have them turn and provide information for either financial gain or out of fear and reprisal. Over the last decade, there has been an increased activity coming from Indian Consular offices in diaspora communities where both infiltration and spying is a legitimate concern. The Sikh community in Canada has been subject to Indian interference in their Gurdwaras, organizations, and even the acquiring of a basic visa to travel back to the Punjab since the mid 1980s. In the current political climate, as the Khalistan movement continues to gain strength across the world, India is increasingly putting pressure on foreign nations where large Sikh populations have settled in order to create a wedge between the host nations and the Sikh community. 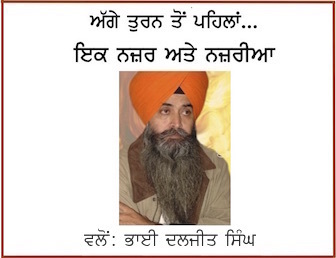 Maloy Krishna Dhar, a former Joint Director of the Indian Intelligence Bureau (based in Ottawa, Canada on a diplomatic posting from 1983-87) confirmed in his book “Open Secrets” that his mission was to infiltrate Gurdwaras/Sikh organizations to malign the Khalistan movement and also to cultivate “a few friends amongst the Canadian Members of Parliament”. 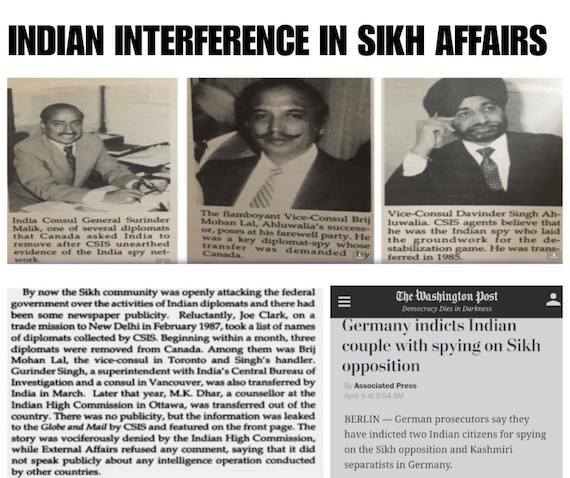 With multiple Indian intelligence agency spies being removed from Canada during the 1980s (see attached picture), Mr. Dhar’s claims were proven true. “Stephen Harper is pushing back at suggestions that Ottawa needs to do more about Sikh separatist activity in Canada, saying his government already keeps a sharp lookout for terrorist threats and that merely advocating for a Khalistan homeland in the Punjab is not a crime. He said violence and terrorism cannot be confused with the right of Canadians to hold and promote their political views. Mr. Harper said he believes other political parties in Canada agree that merely advocating for a Khalistan homeland in the Punjab is not illegal.” – Globe & Mail, (November 8, 2012). On April 7, 2019 the Liberal Government essentially accepted fault for the inclusion of the Sikh community in the “2018 Public Report on the Terrorism Threat to Canada” in the most backhanded way possible. By stating that future reports will not include specific community/faith related references and by not removing the Sikh community’s name from the 2018 report, the Liberal Government is trying to appease both India and portions of the “Liberal” Sikh community in an election year. What has been done by the Liberal Government has fallen remarkably short of what could be considered a fair and genuine resolution with the Sikh community on this issue as this announcement could have easily included a measure to remove the reference to the Sikh community in the 2018 report as well. “The apologists choose to project the Sikh jujharoo lehar (rebellion) as an anachronism of the past—an irrational (“extremist/terrorist”) outburst of violence that has no place in the liberal democratic “present” of their imaginations. They choose to latch on to a clear-cut division of time in order to banish Sikh existence and resistance into the realm of the “Other” in order to maintain their image as obedient, non-threatening citizens. .. The ignorance of these claims overlooks the legacy of genocide and the ongoing structures of repression which inhibit discourses of Sikh sovereignty from the political space in Punjab (52 Khalistani activists have been arrested in Punjab between April—December 2017 alone). Secondly, these claims ignore widespread political movements in recent years which centre around the movement for Khalistan. This includes massive mobilizations against the pending execution of Sikh political prisoners and for their immediate release—all of whom are in prison for waging an armed struggle against the Indian state in the pursuit of Khalistan. The symbolism and discourse underlying this movement clearly focused on the necessity of the armed struggle these prisoners were imprisoned for.” – Prabjot Singh (Sikh Liberation Front), “Confronting Race and Rejecting the Politics of Apology”. It will be shameful for Sikh leadership (organizations and Gurdwaras) to now thank the Liberal Government for the steps they have taken, and we can be sure many of them are getting ready to take this step. Our Panth has been called a terrorist threat to Canada and those in power refuse to remove our name from a report that is readily available in the public domain. My message to Sikh leadership across the country is either stand with the Panth and do not accept this inadequate “resolution” or step aside and let those who can stand take your place. 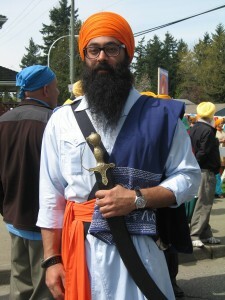 * Author is a Sikh youth leader in Canada and president of Gurdwara Dashmesh Darbar in Surrey (Canada).